On the heels of of the worst drought in California history, state officials are telling water users in the San Joaquin River basin to give up a major share of their water supplies—permanently. The timing, in some ways, couldn’t be worse for farmers who struggled through the drought. On the other hand, the time is right for imperiled salmon that live in the river and its tributaries. This iconic species may not survive the next drought without more water. The State Water Resources Control Board announced in September that it plans to return the San Joaquin River to 40 percent of its “unimpaired flow.” This means the amount of water that would naturally flow through the river without existing dams and diversions. The goal, according to the water board, is to rebalance water demand on the state’s second-largest river. 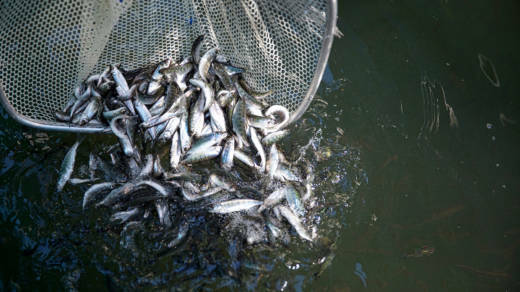 Policy and practice have long favored human water consumption over water quality and wildlife like Chinook salmon, a species in a steep decline for decades. The board plans a similar process for the Sacramento River, the state’s largest river. To reach the 40 percent goal on the San Joaquin River, hundreds of companies and individuals will have to give up a portion of their right to divert water from the river and three of its tributaries: the Tuolumne, Stanislaus and Merced rivers. The biggest water users are farms and irrigation districts, who use the water to grow crops like almonds, cherries, peaches, apples and tomatoes. Major municipalities will also be affected, including San Francisco, which diverts water from the Tuolumne River. The water board has the legal authority to take back water rights when public trust resources, like Chinook salmon populations, are threatened. But it has rarely exercised that authority, partly because to do so requires long and painful deliberations that are likely to result in litigation. The board’s process is effectively a water-quality action: The board is proclaiming that streamflows aren’t sufficient to keep water temperatures cold enough for salmon survival. In fact, the federal Clean Water Act requires the water board to review streamflows every three years to maintain healthy water quality. The state water board holds this responsibility under a custodial arrangement with the United States Environmental Protection Agency. 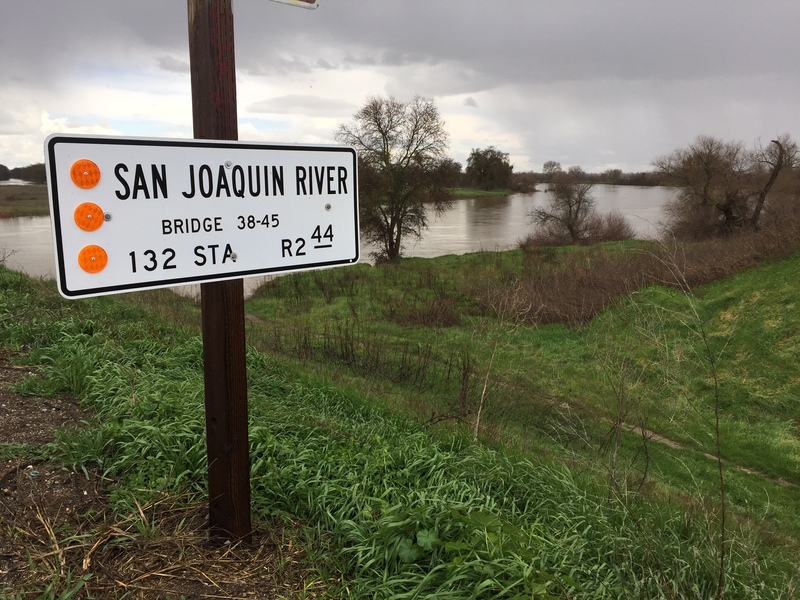 In the case of the San Joaquin River, the board is 20 years late reviewing streamflows: They have not been comprehensively updated since 1995. As part of the water quality plan it adopted that year, the water board also set a goal to double salmon populations, a target that has never been achieved. Supporters of flow increases note that the San Joaquin River today is routinely far below the 40 percent target – sometimes near zero. In many of its reaches, the river becomes a series of stagnant pools for weeks or months at a time. The water board acknowledges that the 40 percent goal is a compromise. Recent studies have shown salmon actually need 60 percent, including a 2013 “flow criteria” report by the board itself, and analysis that same year by the California Department of Fish and Wildlife. But Grober said 40 percent acknowledges that river flows must continue serving multiple purposes in the 21st century. So it has called for a range of 30–50 percent of unimpaired flow, with 40 percent as an interim target. To those who have to give up water, however, the number isn’t reasonable at all. Wenger’s district serves about 100,000 acres of farmland with water diverted from the Tuolumne River. It stores much of that water in Don Pedro Reservoir, which it owns jointly with Turlock Irrigation District and the San Francisco Public Utilities Commission. The water board has received more than 20,000 comment letters from supporters and opponents of the flow increase measure. While many of these are form letters generated by interest groups, Grober said “thousands” are unique letters sent by individuals. The water board staff is in the process of reviewing all these comments, and will then prepare a revised proposal for the board to vote on by the end of this year. 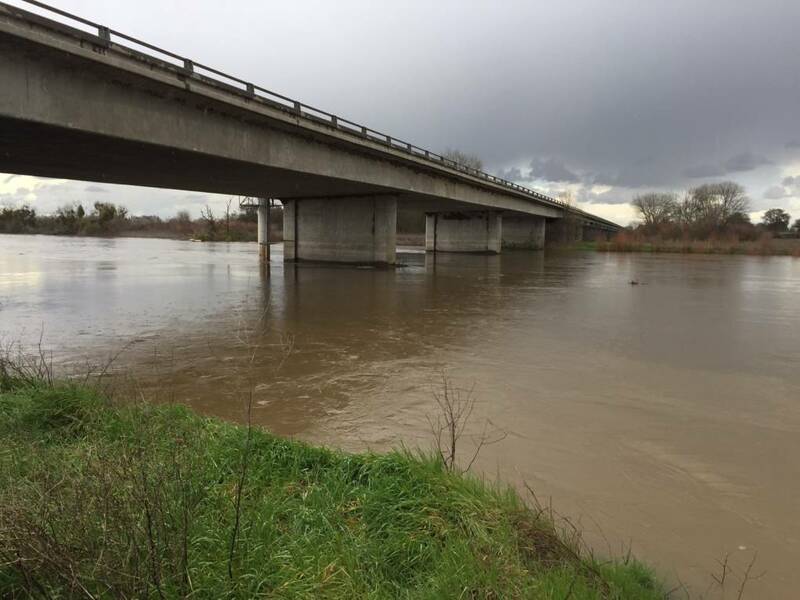 Modesto and Turlock irrigation districts estimate the streamflow revisions could cost their region $1.6 billion in economic output. They launched a website, WorthYourFight.org, to rally support for their cause. Wenger is critical of the state’s proposal, he said, because it requires the 40 percent unimpaired flow target to be met continuously between February and June of every year. Wenger says his district is willing to give up some water for what he calls “functional flows.” This means releasing water for instream habitat when monitoring shows salmon are actually present in the river. This ensures the water will be there when fish need it for migrating and spawning, and won’t require farmers and others to give up so much water. The San Francisco Public Utilities Commission supports this approach, as well. The agency delivers water not just to San Franciscans, but also as a wholesaler to several other Bay Area cities. This water comes from Sierra snowmelt in the Tuolumne River that is stored in Hetch Hetchy and Don Pedro reservoirs. Steve Ritchie, the commission’s assistant general manager for water, said the hit to his agency could be even worse than the water board has estimated because of contract language between San Francisco and the Turlock and Modesto Irrigation districts. The contract, which involves their partnership to operate Don Pedro Reservoir, may require San Francisco to absorb 52 percent of any required streamflow increases. As a result, Ritchie said San Francisco could be required to build 900,000 acre-feet of new water storage to make up for the proposed streamflow losses. To put that in perspective, 900,000 acre-feet is nearly triple the capacity of its existing Hetch Hetchy Reservoir. It could also require the city to impose conservation measures “that we just wouldn’t be able to achieve,” Ritchie said. That’s because San Franciscans are already the state’s water conservation leaders. Their daily water consumption during the drought fell to just 41 gallons per person, the lowest in the state. San Francisco says “functional flows” would ease the pain by ordering more water only when and where needed, not all the time. Grober counters that the state’s proposal accomplishes something similar. By phrasing the flow increases as a percentage of unimpaired flow, it is naturally flexible. Water users would be required to give up a percentage that varies according to the season and according to the presence or absence of drought. Obegi, the environmental attorney, notes that continuous flow increases over a period of months is important because more than salmon need that water. More flow boosts the food chain, helping to breed aquatic insects that salmon and other species depend on, and it sustains plants that create vital riparian shade in the scorching San Joaquin Valley. Adjusting water rights in the traditional manner requires the board to start a complicated adjudication process. This is similar to a court proceeding in which the board functions like a panel of judges, hearing testimony as water users summon witnesses. It is tedious and time consuming: Resolving all the water rights to increase streamflow could take years. In hopes of a faster result, Grober said the state is “vigorously” encouraging water users to offer settlements as an alternative to simply taking back water rights. A settlement would make streamflow improvements happen much faster. Water users would voluntarily enter into a binding agreement to give up some lesser amount of water in addition to making other habitat improvements, such as controlling invasive species and restoring streambed spawning gravels. To push the process along, the state brought in a high-powered mediator: Bruce Babbitt, the former U.S. Interior Department secretary under President Clinton. Babbitt has been holding a series of closed-door meetings among the parties in hopes of reaching settlements between water users, environmental groups and state officials. Participants were required to sign a confidentiality agreement, so little information is available about how the talks are proceeding. But word is that the parties remain far apart. Some environmental groups, for example, view the state’s 40 percent unimpaired flow target as a starting point, and they want to see an even higher number in any negotiated settlement. Water users, of course, want less than 40 percent – a lot less, in some cases. If they can’t reach a settlement, the water board is expected to adopt a new flow requirement by the end of this year. Then it would move into an adjudication process to actually begin amending water rights to make the flow increases happen. This is likely to bring separate lawsuits from water users, which would further delay any streamflow improvements. This article originally appeared on Water Deeply, and you can find it here. For important news about water in California, you can sign up to the Water Deeply email list.